Dubai, UAE, October 21, 2018: Siemens and the Ministry of Electricity of the Republic of Iraq have entered a milestone agreement to seek the implementation of the company's roadmap for repowering Iraq. 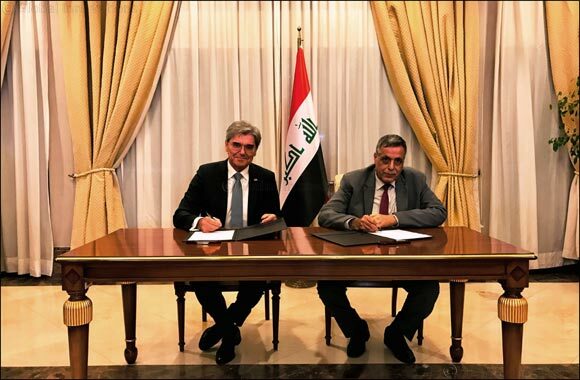 Signed by Qasim Al-Fahdawi, Minister of Electricity, and Joe Kaeser, President and CEO of Siemens AG, the Memorandum of Understanding (MoU) will examine a series of short, medium and long-term plans to meet the reconstruction goals of Iraq and support the country's economic development. In September, Siemens announced the donation of a smart health clinic that would be powered by solar energy and equipped with Siemens medical devices. The clinic would have the capacity to treat up to 10,000 patients per year. This was in addition to pledging to fund the first modular “School of the Future” in Iraq, provide a USD 60 million software grant for universities in the country, and train more than 1,000 Iraqis in vocational education. Under the “Roadmap for the Electrification of the New Iraq”, Siemens is ready to add 11 gigawatts (GW) of power generation capacity over four years to ensure 23 million Iraqis across the country have reliable and sustainable electricity 24/7. This would boost current generation capacity by almost 50 percent. The economic viability of the plan is secured by billions of US dollars in potential fuel savings and revenue generation for the electricity sector, supporting the development of the future Iraq. The company also envisions the creation of tens of thousands of jobs over the course of the projects. The roadmap emphasizes people at its core – and is the result of a 12-month study to develop a comprehensive and tailored redevelopment plan. It focuses on energy, education, compliance and financing, aiming to advance sustainable economic development, national security and quality of life for the people of Iraq. Siemens' Iraq Roadmap outlines eight objectives to benefit the people of Iraq, the country's national security and its economic development. These include reducing energy losses, introducing smart grids, strengthening the transmission grid, modernizing existing power plants, adding new generation capacities in deprived areas, connecting Iraq to the Arab Gulf region, putting Iraq's national resources to work, and investing in its people. Modernizing the country's energy infrastructure is intended to be completed in stages, from immediate improvement for up to 300,000 people, which can be operational within three months, to medium and long-term projects that require between 10 and 24 months' completion time and beyond. The company will also assist Iraq's government in securing appropriate finance packages provided by international commercial banks, Export Credit Agencies and supported by the German Government. The roadmap lays out plans to use Iraq's valuable natural resources more efficiently by utilizing flare gas capture and treatment technologies to deliver a domestic source of fuel to Iraq's power generation sector, as well as create a long-term source of revenue for the government to finance power generation, transmission, and distribution projects. As part of its commitment to driving sustainable growth, Siemens intends to support social development in Iraq with a series of training and education programs. This includes technical and vocational training as well as transparency and anti-corruption education, in order to build a pool of highly skilled, local talent with a culture of compliance. Under the patronage of the German Federal Ministry for Economic Cooperation and Development (BMZ), Siemens aims to provide vocational training, starting with 1,000 young Iraqis. Siemens initially presented the Roadmap to the Government of Iraq during the Iraq Reconstruction Conference in Kuwait, in February 2018. At the same time, the company signed a declaration of intent with BMZ with both parties agreeing to jointly contribute to the reconstruction and development of Iraq in areas including technical and vocational training, as well as transparency and anti-corruption.